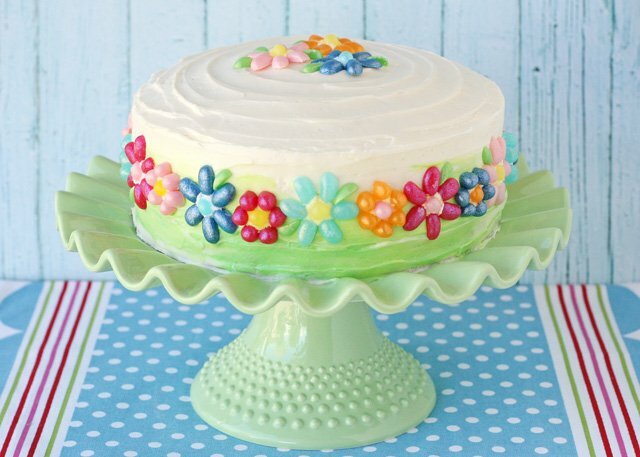 Combine cake, candy and fun colors… and this Jelly Belly Flower Cake is sure to brighten any celebration! My family and I recently toured the (Fairfield, CA) Jelly Belly factory. It was so fun to see how these colorful and delicious little jelly beans are made! I came home from the factory with a few big bags of the newest addition to the Jelly Belly family, the Jewel Collection. These new Jelly Belly candies have a beautiful shimmery look. I was inspired to make a pretty dessert with my new “jewels” and this colorful Jelly Belly Flower Cake is what I came up with. After playing around with the pretty Jelly Belly candies a bit I came up with two different flower shapes to adorn the cake. Both flowers are made from 3 and 1/2 Jelly Belly, just cut in different ways. 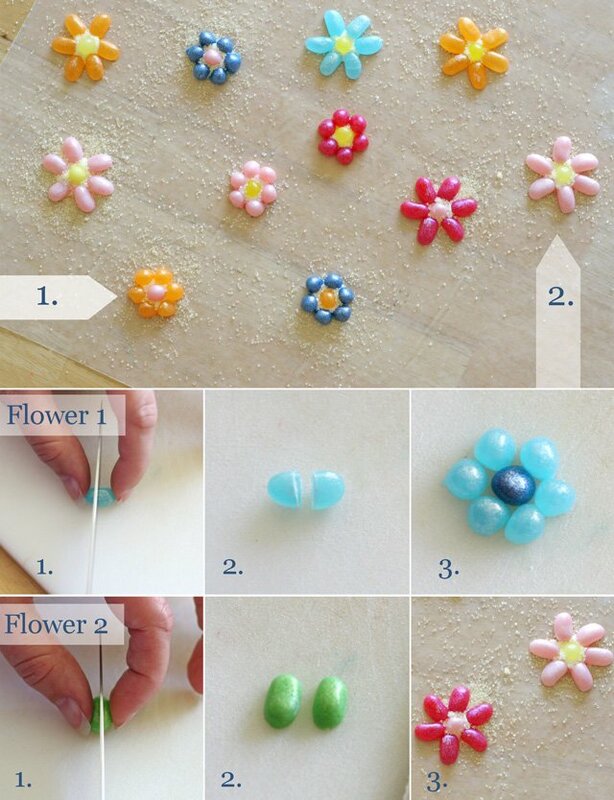 Each flower shown is make using 3 and 1/2 Jelly Belly. I used a small serrated knife, and used a bit of a rocking motion to cut the Jelly Belly candies. Flower 1 (more compact) is made by cutting Jelly Belly candies in half, across the shorter part of the bean. For each flower, cut the pieces, then just lay out the flowers as you would like, onto a piece of waxed paper. Mix and match colors as desired. 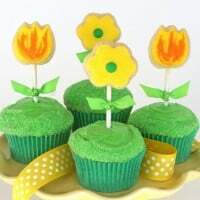 Next, attach the flower parts together, using royal icing (shown below). I made a small batch of royal icing using 2 cups powdered sugar, whisked (in my electric mixer) with 2 tablespoons meringue powder and about 4 tablespoons warm water (yes, I know 4 tablespoons is 1/4 cup, but I like to add the water a tablespoon at a time, so it’s easiest to list it this way). Beat the ingredients together, and add a bit more water as necessary to create a thick royal icing. The icing should be about the consistency of toothpaste, not so thick that it’s too hard to squeeze from a bag, but not so thin that it just oozes out into a puddle. Put (some of) the royal icing to a small ziplock type baggie (or a plastic piping bag) and snip off the end (just a bit). Remaining royal icing should be kept covered at all times. 1. Squeeze a small dot/mound of royal icing onto a piece of waxed paper (as shown above). Place one Jelly Belly half in the center, and there should be icing all around the Jelly Belly. 2. Add the other “petals”, making sure they touch some icing. 3. Once you’ve formed the flower shape, sprinkle some sanding sugar (I used pale yellow) on top of the flower, this will hide any excess royal icing. Allow the flower to sit (with the sanding sugar on top) at least 4 hours (or more). 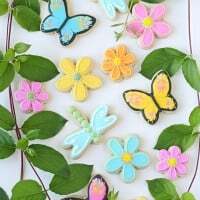 Once the royal icing is dry, remove the Jelly Belly flowers from the waxed paper, shake off any excess sanding sugar, and use flower as desired. I also made some simple Jelly Belly leaves (pictured above). 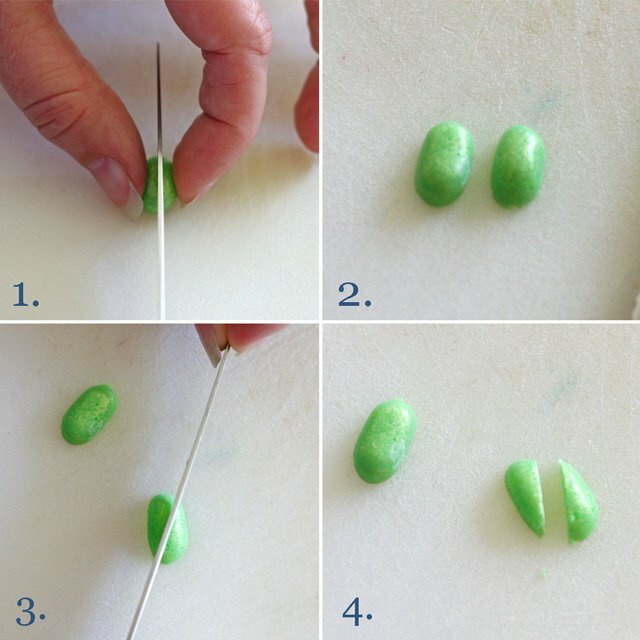 For the leaves I cut a green Jelly Belly in half lengthwise (images 1-2). Then cut each half at a diagonal, as shown (images 3-4). I made a bunch of leaves and just set them aside, then added them right to the cake after I added the flowers. While the Jelly Belly flowers were drying I baked up an 8″ vanilla cake. For this cake I used a boxed mix, which is rare for me, but my focus on this cake was the decorating. I do have a delicious Vanilla Cake recipe which would work great as well. I divided the batter into two 8″ cake pans (oiled and floured, with parchment paper on the bottom) and baked according to the directions listed. For the frosting, I made a batch of American Buttercream Frosting (with the addition of 1/2 block -4oz- cream cheese). This was the perfect amount of frosting to fill between the two cake layers and frost the outside. 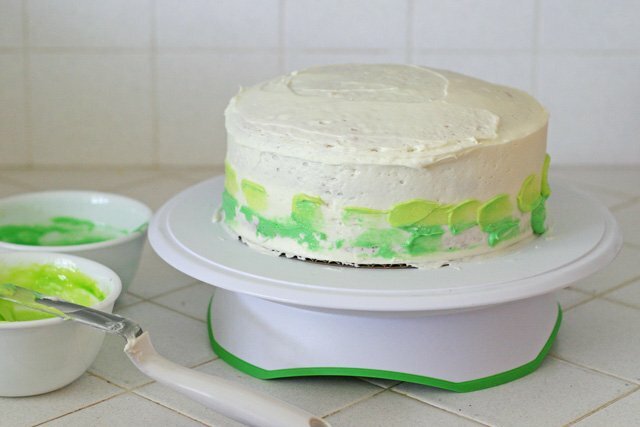 I frosted the cake with white (uncolored) icing, then made up two very small bowls of green icing, one using (1 drop) Americolor mint green, and one using (1 drop) Americolor Electric Green. I added a bit of the green icing along the base of the cake, then used a small off-set spatula to swirl the icing around the sides of the cake. (Above) I frosted/crumb coated the cake in white frosting, then put the cake in the freezer just as shown above. The icing does not need to be perfect at this stage. (Above) After the frosted cake has been in the freezer about 15 minutes, I added the two different colors of green icing (in dots, as shown), along the base of the cake. I also added a bit more white icing, as needed. Then, I used the offset spatula to smooth the icing on the sides of the cake, holding the offset spatula vertical. (Above) After I smoothed the icing a bit, I added some texture by holding the offset spatula horizontally and dragging the end of the (rounded) blade through the icing (while turning the turntable). Work your way up the cake, then use the same motion to create a spiral in the icing on the top of the cake. 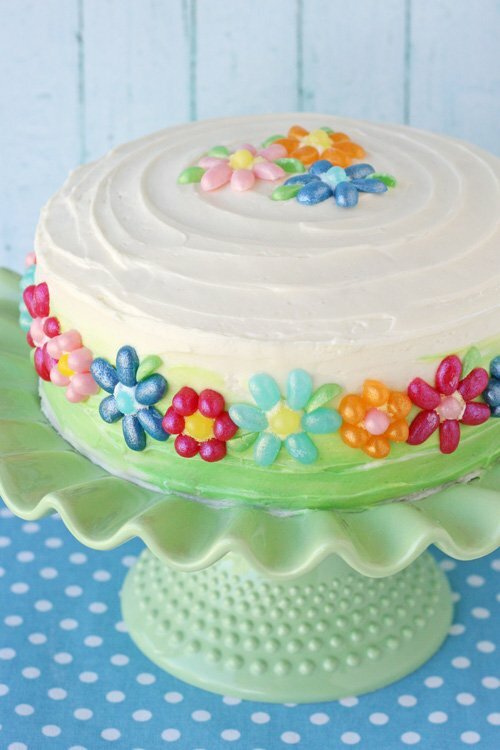 As soon as you’re happy with the icing (it does not need to be perfect, some texture adds to this look), add the Jelly Belly flowers as desired. I laid out the flowers ahead of time (on a piece of waxed paper) in the order I wanted to place them on the cake. Add a few leaves as desired. 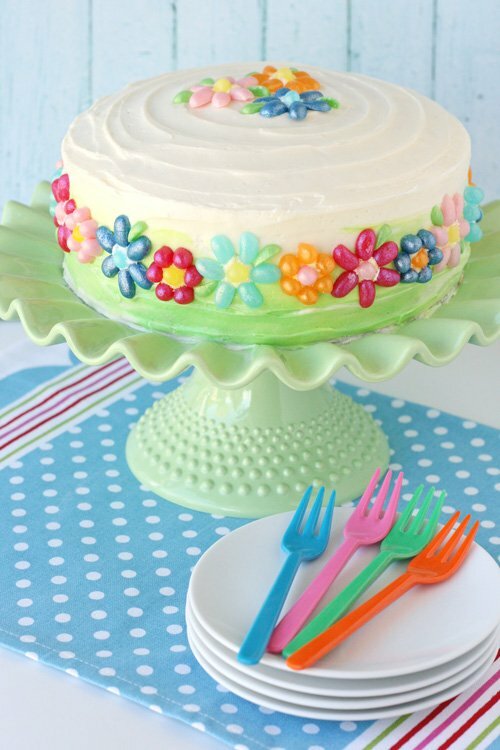 This colorful cake could be a perfect farewell to summer, or used to brighten someone’s day most any time of year! Colorful forks – Available from Shop Sweet Lulu. 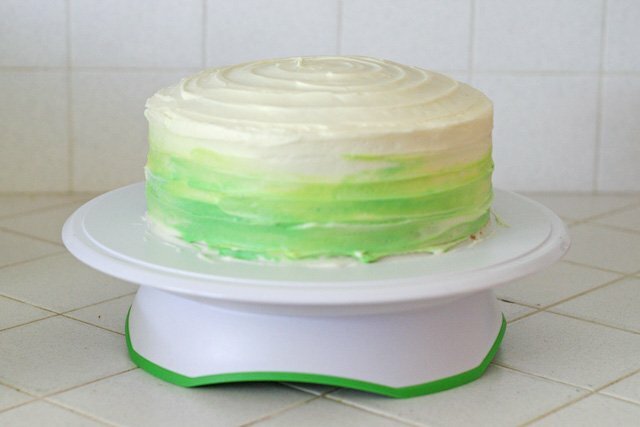 Green cake stand – Purchased Spring 2013 at Costco, no longer available. Disclosure – I was compensated by Jelly Belly with products and/or payment to create this post, but all text, images and ideas are my own. I love this cake so much! It definitely makes me smile to see it. So so lovely! I’ll have to make it for one of my girls’ birthdays. Thanks so much! I bet your kids would love helping assemble the flowers (if you do the cutting). I love this. It is so simple and elegant all at the same time. This is truly beautiful. This is gorgeous! I still can’t believe I’ve never done the tour there. We went once but just toured the gift shop. Yes, I’m sure mini you would love it! Beautiful Cake! I love it! Thanks Robin! You always do such gorgeous and creative cakes yourself!! Thanks! The background is a photography backdrop I purchased from Ink and Elm (online). Very pretty cake-screams happy to me! Thanks! Hi there. I am very new to baking actually (infact the reason I wanna learn baking is to be able to make excellent cake when my baby daughter turns one next year). I came across your page and I just love how you have explained stuff. I love your work, your photographs as if I just wanna take a bite of each one of your cakes. The best part is how you make everything so simple by explaining each and every detail. I m just in love with this cake, your red velvet cake and the chocolate cupcakes and the cream cheese icing and i’ll share pics and links with you when I make my own cakes since you happen to be my biggest inspiration :). Thanks and keep up the amazing work you’re doing. Ah, so pretty!! Love the attention to detail and going the extra mile to cut the beans and arrange them into flowers seems well worth the effort! Beautiful! I know how I’m going to decorate my daughter’s 39th birthday cake on September 1. Need to get my Jelly Bellys. I’m also making her your hibiscus cookies. Thanks Gloria! Keep the ideas coming. So cute, Glory!!! I love the shimmer you gave the Jelly Bellys!! Love it! Glory, this DEFINITELY made me smile. I saw their contest about two years ago to use their product on, I think, cupcakes, and they had examples, but the photos were always too small to figure out what they had done. Your cake is so colorful and so versatile for so many occasions. Thanks for making it and for taking pix of the steps and info. Will def be making. Thanks for the smile!! I’m a big fan of you! Glory, such a sweet cake. Who can resist a Jelly Belly – and then when they top an adorable cake – well I don’t think anyone would be able to turn down a slice. Any child, or adult (like me) would smile at the sight of this cake. You never fail to amaze! 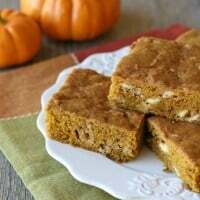 I absolutely love this cake and can’t wait to try it myself. What a CUTE idea! I love that it is something for any skill level. Thanks! How do you get your frosting so white? Mine always ends up yellow from the butter! Hi Marnie, I don’t have any tricks to share. The only element that adds a bit of an off white color is usually when I add the vanilla, but it’s worth that to me! For this frosting I used Challenge brand, unsalted butter. Love this idea! It came out very beautiful! Oh my boys would love this cake, it’s fabulous!! What a cute cake that the factory tour inspired you to make. I love this! So creative and fun with the Jelly Bellys. The flowers are so cute. I absolutely love how you blended the frosting with the two shades of green. Gorgeous. My youngest daughter would ADORE this cake, she loves jelly belly beans!! Sweet! Jelly Bellys are my favorite! I like how you “painted” the base of the cake. So pretty! I love this and all your creations! I really think that this is one that I can manage! What creativity! Your work is always beautiful! Hi Glory – what a beautiful cake. I have the same turntable as you, but I have yet to use it. If a colored frosting touches the white base, have you noticed if it will stain? Hi Ruby, No, the frosting will not stain the stand at all. I’ve used many different white, glazed ceramic stands with all different colors of frosting touching the stand and never had any problems. Happy baking! This cake made me smile. Too cute. I think I can hande decorating a cake like this one! The cake stand is so beautiful! I’ll have to keep a look out for these shimmery jell bellies. Love you! You are amazing! I love browsing through all your recipes and ideas and really like the way you describe step-by-step how to make things. Although I’m not really a baker, I am definitely going to try some of your recipes – you make everything look so simple. Just came across this and had to pin it to do for my daughter’s birthday. Love it! So cute. that is adorable, so lovely for spring! This looks fabulous, and so fun to make! I love your attention to detail. And your talent to execute your ideas. What a beautiful cake! How many flowers did you have to make to go around the cake? Just found your beautiful Jelly Belly Flower cake on Pinterest. Have a question for you: Do the jelly beans bleed or run on the butter cream icing? 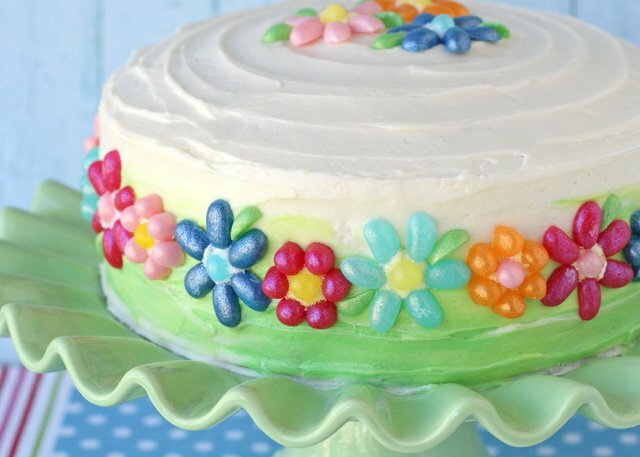 I saw you use Royal Icing to make the “flowers” and then stick them on the cake. How long will they stick? That is, I have to decorate a cake the night before to transport to my g-kids the next day. Wouldn’t want them sliding off on the drive over. If you could please respond via my e-mail that would be lovely. Thanks! 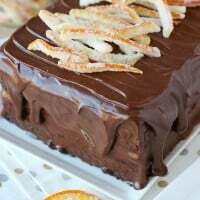 i love this cake and i will try it soon..thanks a lot. 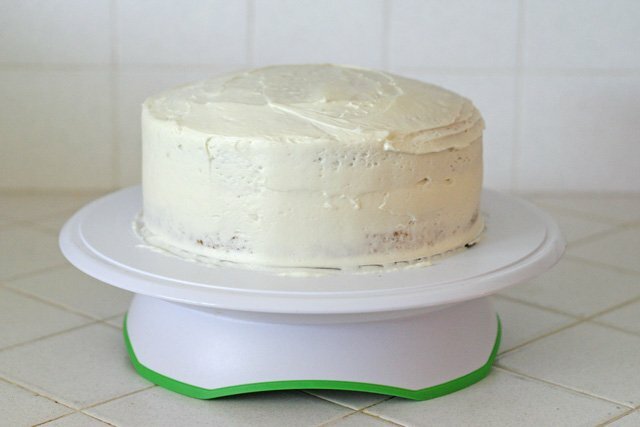 Why line the cake pan with parchment paper? Won’t it burn? Well written! I appreciate the detailed description of every step to create this lovely cake. You are a great teacher! Thank you for posting!